There are lots of small everyday things that could benefit from being designed better. Things we take for granted in everyday life. But when designed well, things just work, leading to enhanced experience, satisfied customers, appropriate actionability, increased sales, etc. This post is about few of such small everyday ideas. Like handles on doors. 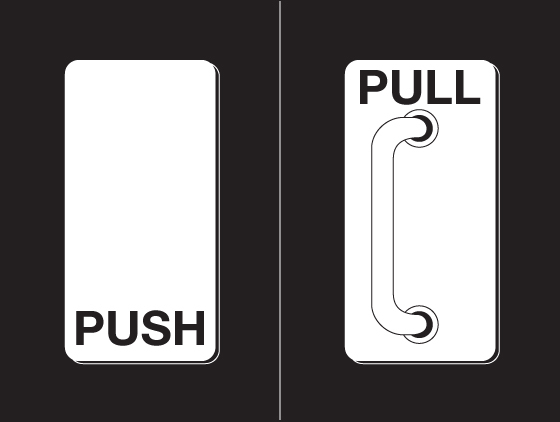 If there is a handle on the door, the tendency is to pull it. But almost all doors have a handle on the side it says push, too. If the door needs to be pushed, why have a handle? Simply keep it flat and we’ll push it. When composing emails, wish there was a reminder to attach our files, when words like ‘attached’ or ‘attachment’ were found in the composed email. ‘No Parking on Odd dates 1 3 5’ and ‘No Parking on Even dates 2 4 6’ tend to be so cumbersome. We need to first think about what date it is today, then figure that its ‘No Parking’ on that side, which means we can park on the opposite side. Instead what if we had ‘Parking on Odd dates only’ and ‘Parking on Even dates only’. Because there are two traffic signals in view at all times, one after the zebra crossing and one much ahead on the other side of the junction, we Indians always push ahead wanting to be first (in whichever race that is) therefore not stopping at the zebra crossing and not allowing pedestrians to cross. So to get cars to stop at the zebra crossing, only one traffic signal needs to be there, placed just before the stripes begin. Instead of having to choose from financial retirement plans with complicated numbers, what if we could choose, by looking at pictures of different homes (1, 2, 3, 4 BHK) that could be bought with different levels of retirement income. I often get asked about what mega-pixel camera on the phone is good. Fact is that we don’t understand what mega-pixels mean. What will be useful to us is the information of what mega-pixel matched what size of print. But we know this one won’t happen, else phone and camera manufacturers won’t be able to convince us to mindlessly upgrade. Remember using the plastic card key in your hotel room to start and switch off the power. Wouldn’t it be convenient to have one in our home, so that we could start/switch off the power with one stroke and do away with the nagging feeling of not having turned off the geyser or gas or some other appliance after leaving home? The tendency is to think of these design ideas as small (insignificant) ideas, but they are the ones that make for the most awesome product, service experiences and of course get us to behave.